In a no gi Brazilian Jiu-Jitsu class a few weeks back a guy was monstering me all over the mat. He passed my guard like a hot knife through butter, got into side-control, and after a few seconds, mounted me. Was able to buck him off but soon ended up in his guillotine choke. Used a classic over-the-shoulder defence to shut it down, but before long he had me in back control, hooks in. By then I was exhausted, as I struggled to fight off his attempts for a rear naked choke hold. But the battle was tiring him as well and fatigue invites us all to make mistakes. He made one—crossing his feet over my legs. Remembering the defence I learned years ago, I swung my right foot over his ankles and leaned back on him. Felt the tap instantly. On more than one occasion I have been on the other side of this story. Just when I thought I was getting the better of someone on the mat, they turned the tide, and tapped me out. That is the nature of Brazilian Jiu-Jitsu. The moral of the story—never give up, even against a superior grappler. It ain’t over till it’s over. As long as you are fighting, you are still in the game. Yep you are still in the game if you don’t quit. Many people think if something does not work – they can stop and just try again. Fighting is not like that – you may not get another chance so it is best to try and work through the adversity and get the win. Hi John! Like Eminem says, “You only get one chance, do not miss this opportunity to blow up”. You are so right, you may not get another chance in a fight. Yes, there is no such thing as perfect conditions for a fight. Thanks for your visit John. Hey Matt, I haven’t visited your site in a while – it’s looking good. 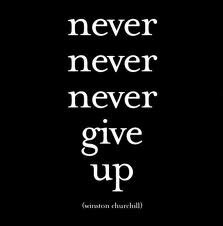 Thanks for reminding us to Never Give Up – and for reminding me of Winston Churchill’s amazing speech “Never Give Up, Never Give Up”. And who’d want to disagree with Einstein! Hi Jan, great to see you here. Glad you liked Churchill’s speech. He was one heck of a leader when it counted most. THis is one thing i like about karate ! Thanks harsha for your comments. Karate definitely builds our minds and spirits as well as our bodies.